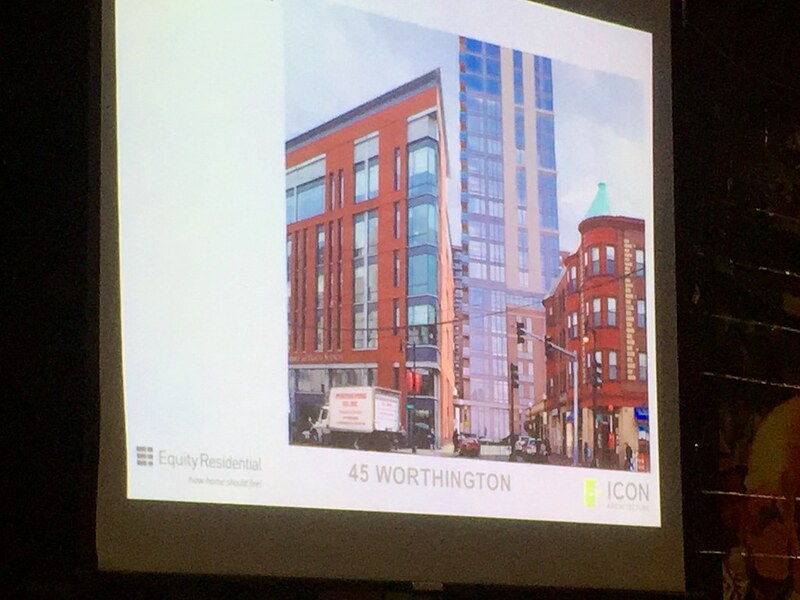 Equity Residential has submitted a Letter of Intent to construct a 35-story residential tower with 385 units (studios, 1 beds, and 2 beds) at 45 Worthington Street in Mission Hill. 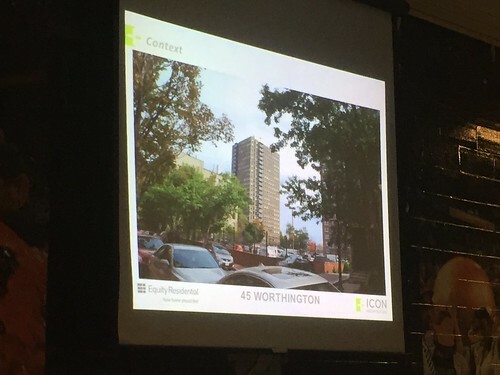 Their first presentation to the community and IAG was the evening of December 10th, 2014. 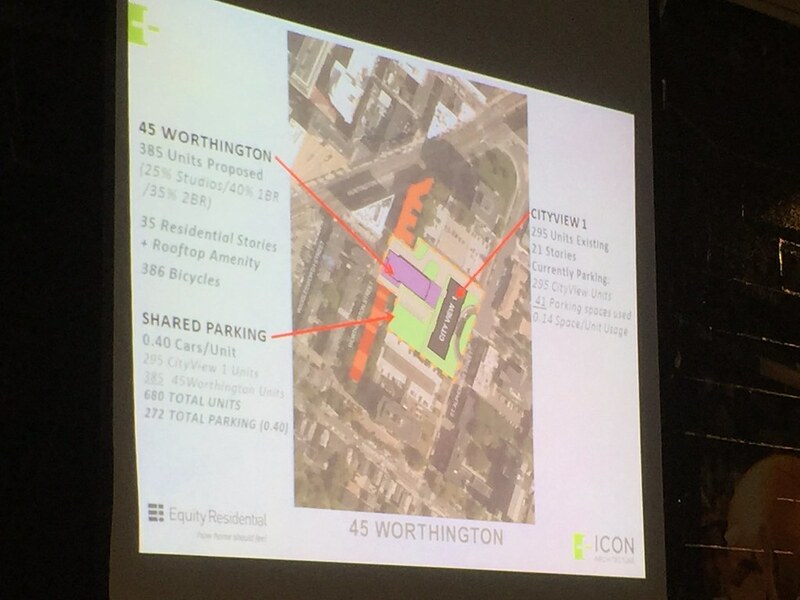 Surprisingly, there was a very large turnout of nearly 100 people from the community to learn about this project. 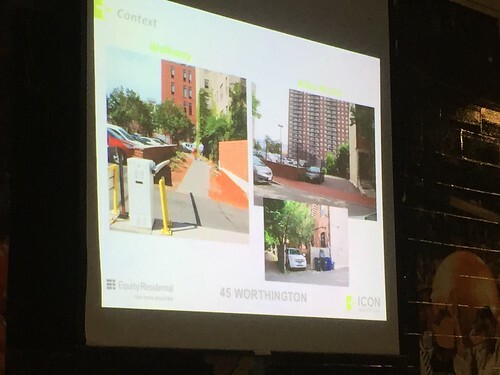 The following images were photographed during that presentation. 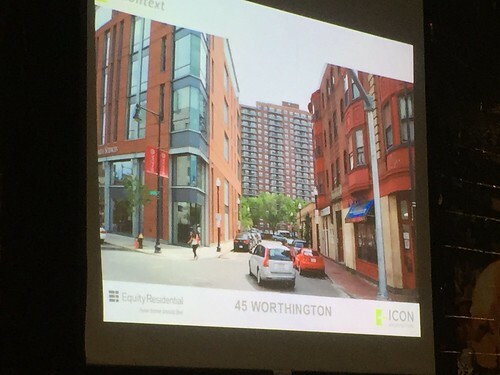 Doesn't look like this will have retail space but it still wins for it's height in Mission Hill. Design doesn't look too bad either. Ill be the first to say it. Kensington. With that being said it looks like an improved version with better proportions. What will it be replacing? 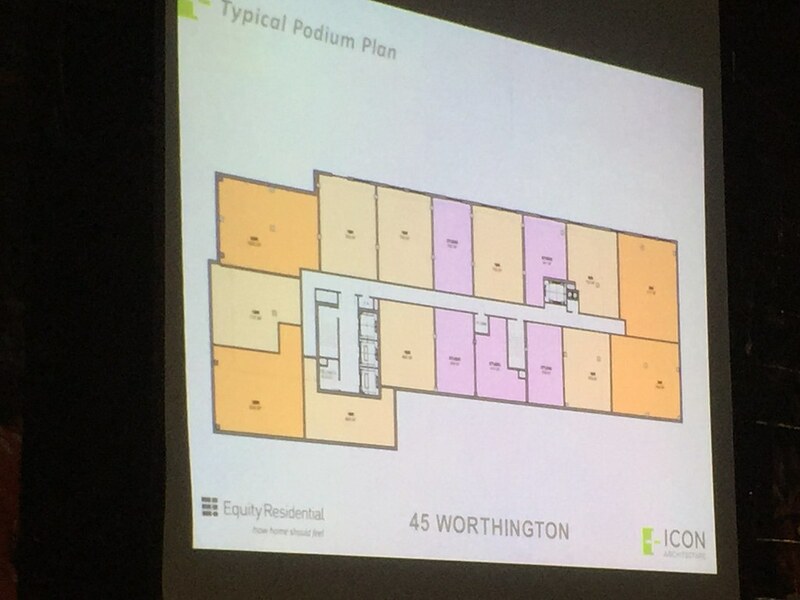 The neighbors cannot be happy with this proposal. what was the general vibe of the crowd? 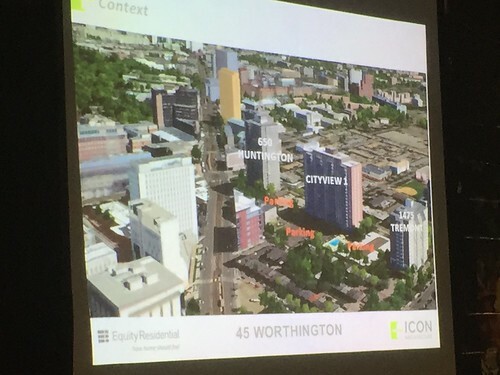 This one came out of nowhere, but would be a nice new peak for the Longwood/Huntington area. Build it! Bring more of this to Kendall too! 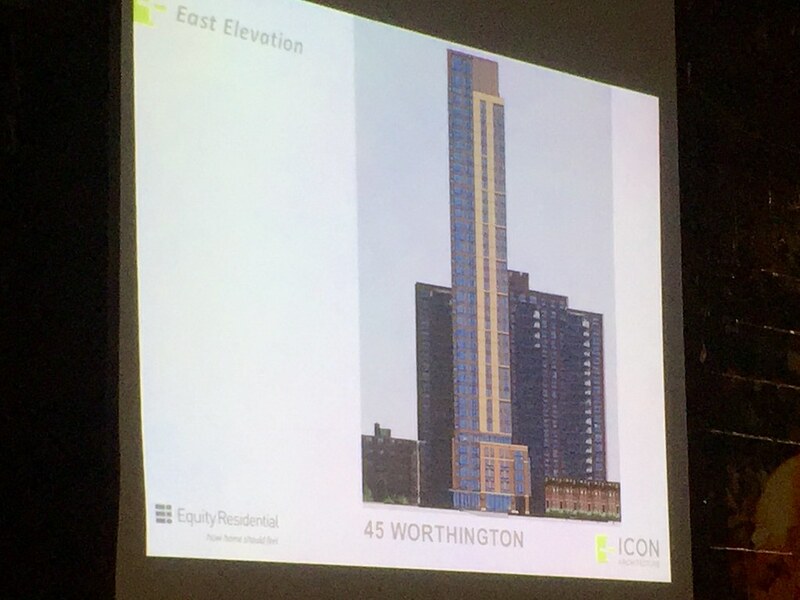 There's also a precedent for residential buildings near this height in that area, so maybe it won't have to lop a few floors off. 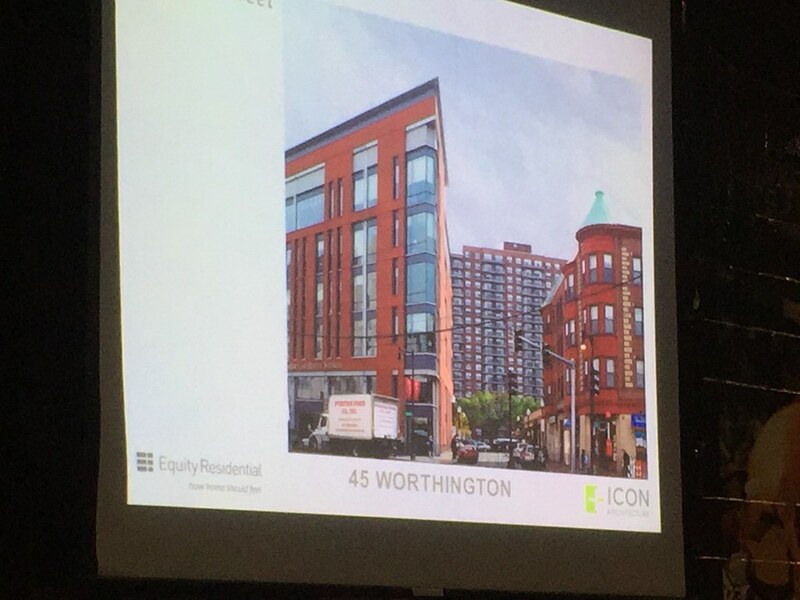 Worst parts of the Kensington are the wavy glass wall, the color of the spandrel, and the terrible panels on the very top. Looks like this one avoids those 3 major pitfalls. This is great. 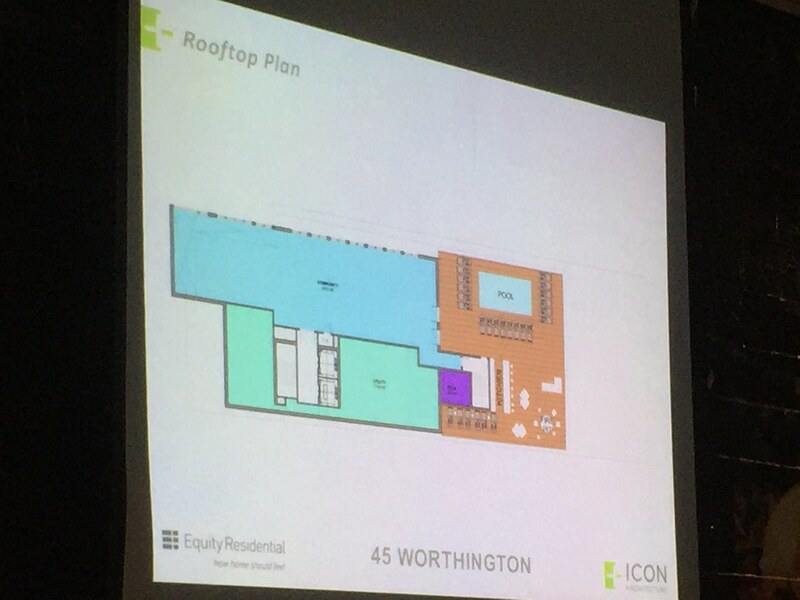 Very respectful of context on street level, and fits into an already expanding Huntingon-corridor skyline. 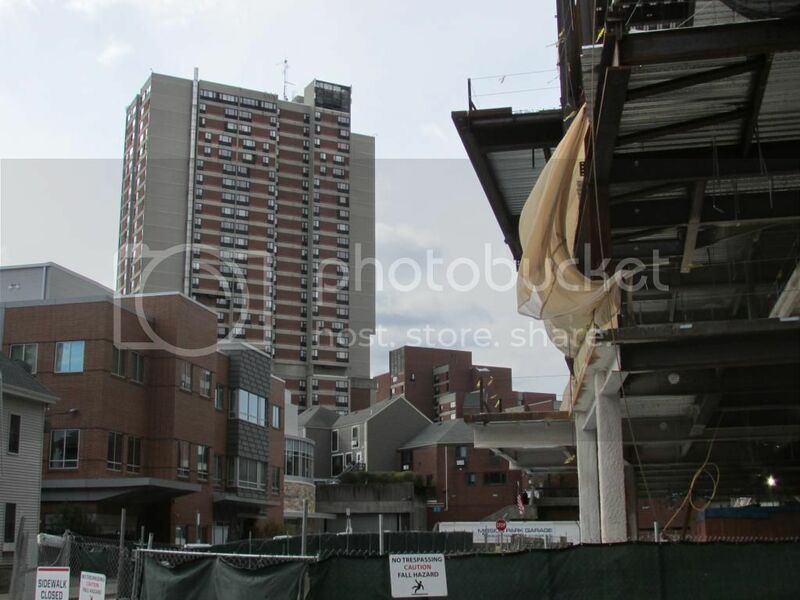 Mission Hill, strange as it may seem, already has one of the most dense clusters of high rises in the city outside downtown/Back Bay. Yep, build it, and build more like it. 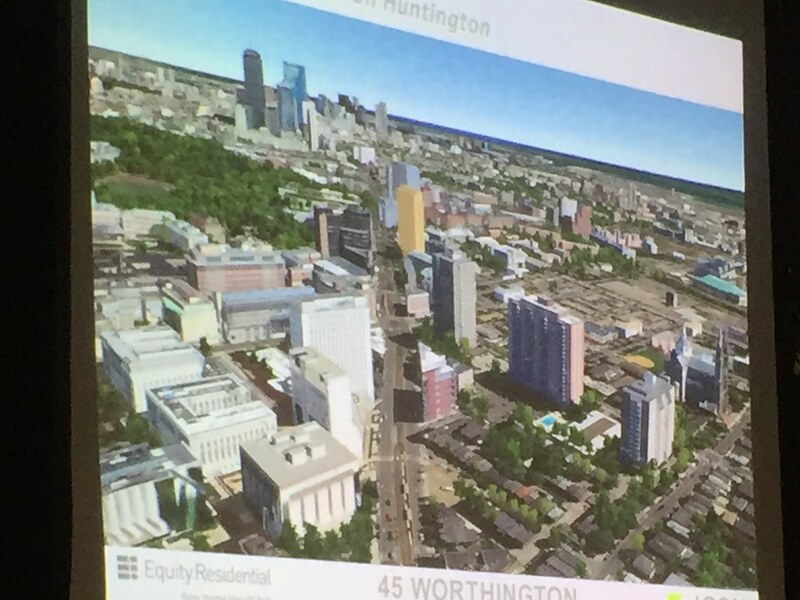 The area already has some height, it is near two transit lines, a major employment center, and educational institutions. This is precisely the location for residential towers. 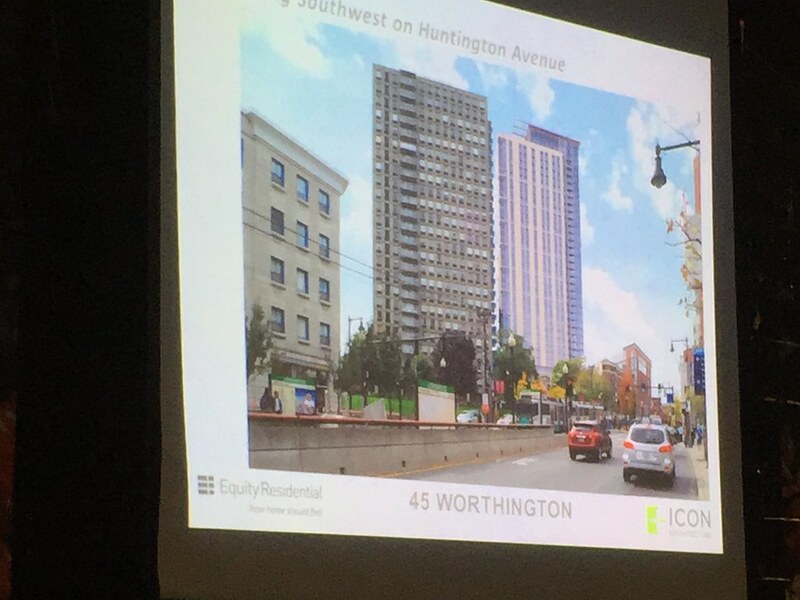 30,000 units can't happen just through Seaport luxury builds. 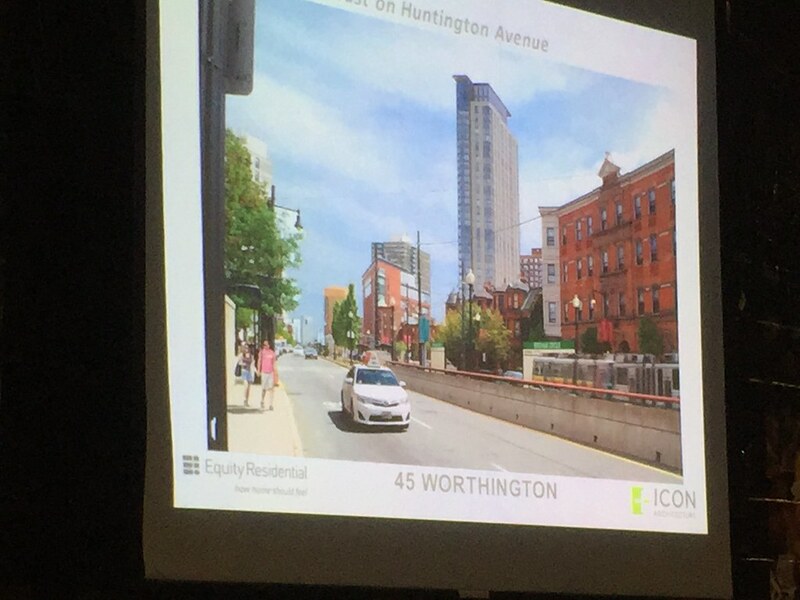 We need towers like this in Mission Hill, and a lot more four to five story apartment buildings in more outlying neighborhoods. 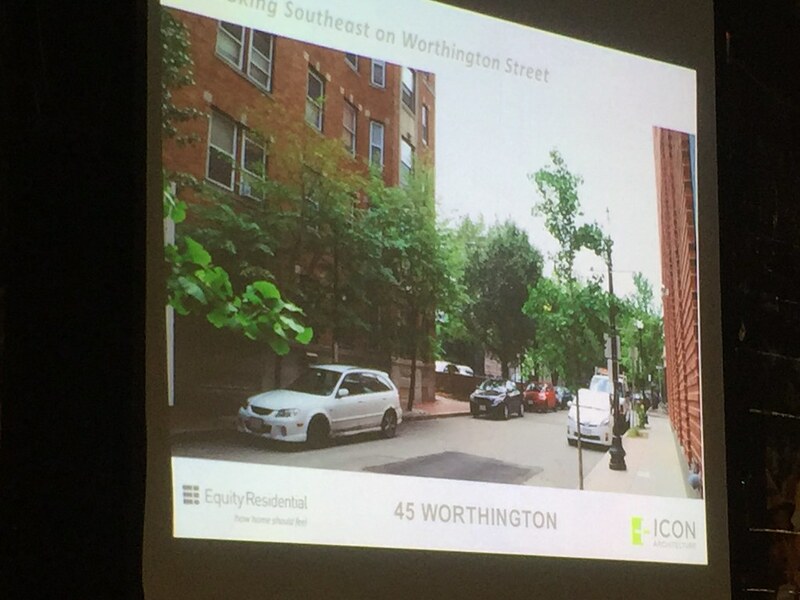 I must say that the sentiments on this board are a total contrast from those of the Worthington Street neighborhood that attended the meeting last night. I think only I and maybe one other person openly spoke favorably about this project. I like the cluster that is forming around that area. And with more residents moving to an area that has no more room to move outward the only reality is that you have to go up. 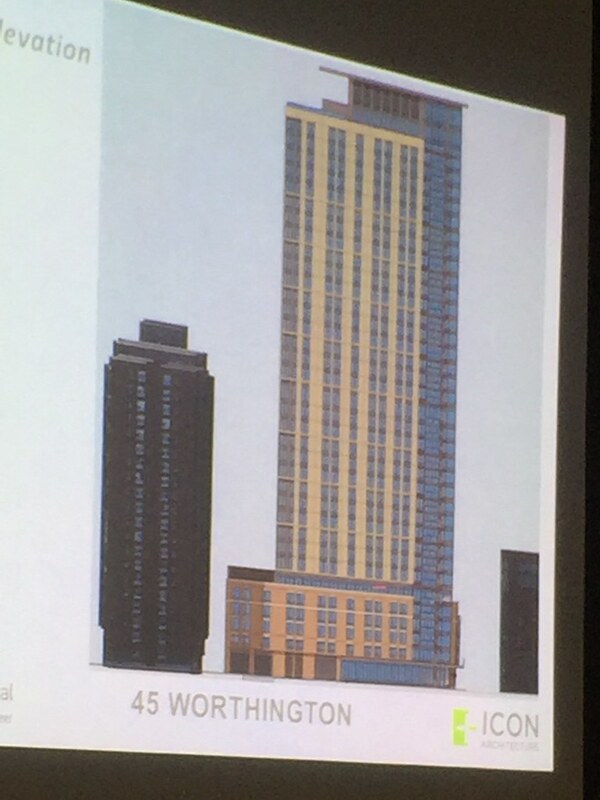 I think that 35-stories is definitely appropriate for this area. I am praying that they do not VE'd this to death. We already have one Kensington do we really need another one in a different part of town? 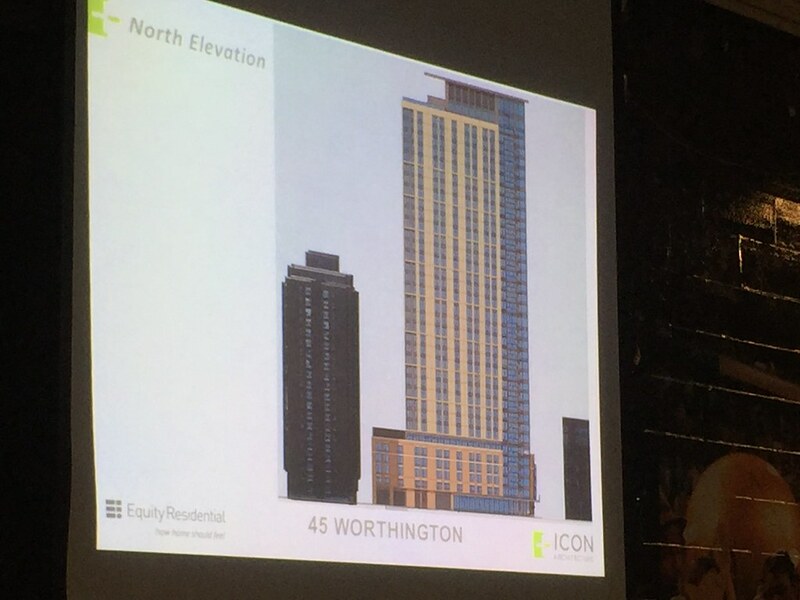 I would love 35 stories, but I'm going to predict 23 stories and a mid 2016 groundbreaking. 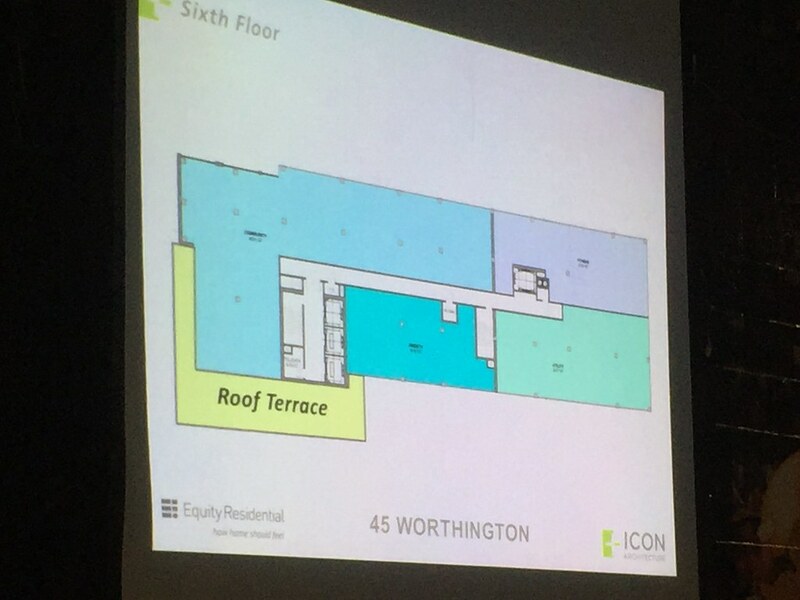 I was at the meeting with dshoost and my worst nightmares came true. They totally blew the massing on this one and poisoned the well entirely. 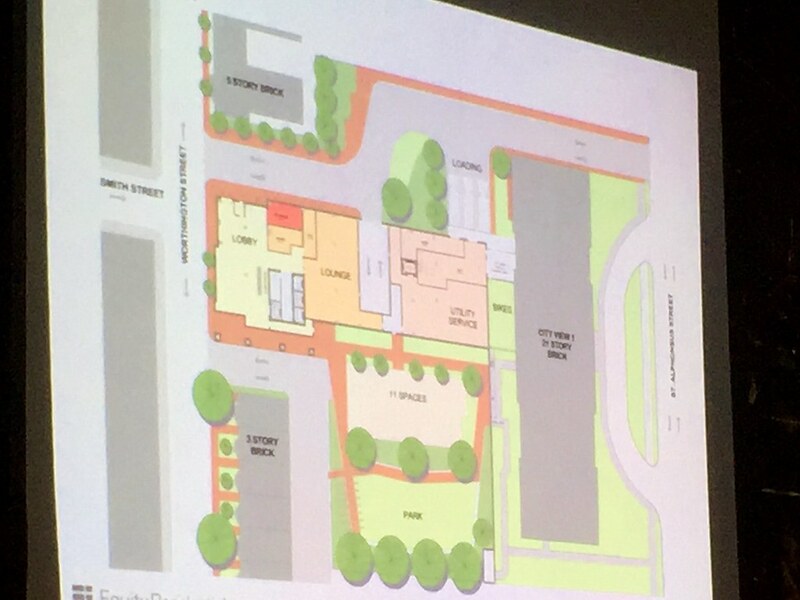 The Mission Hill residents are so pissed off with Equity that I don't even think they'd allow a modest proposal at this point. 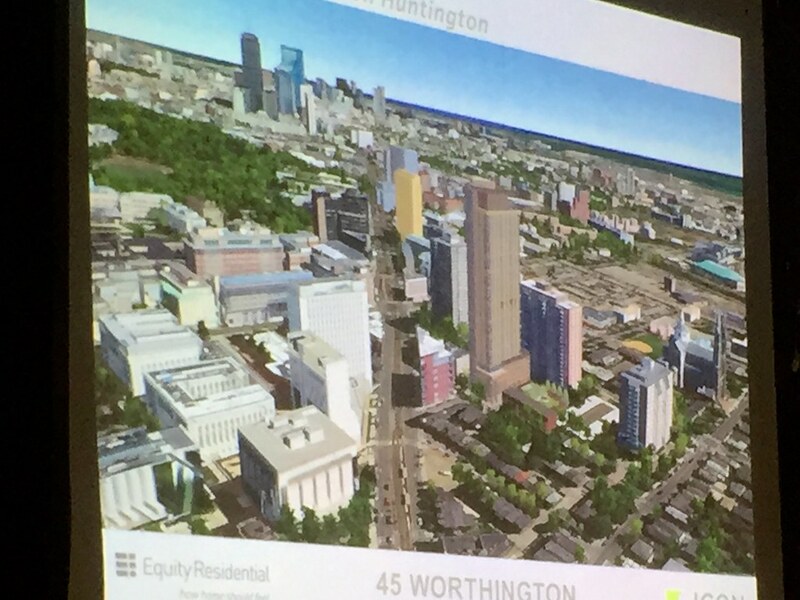 I lived on Worthington and I felt the citizens' pain. 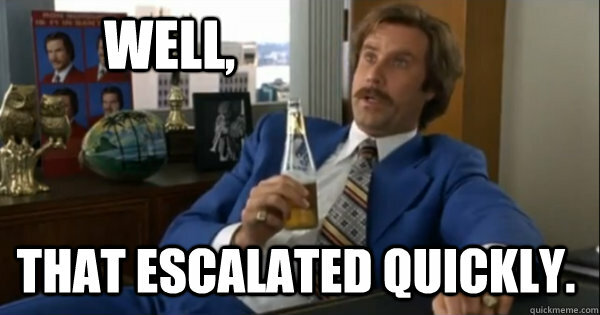 It honestly felt like the 1960s all over again. 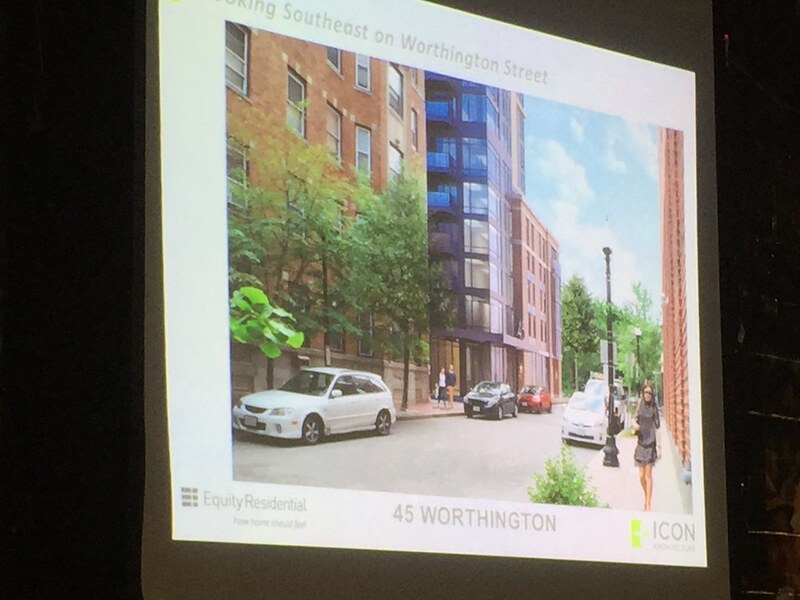 I'm speechless, offended, and in shock from the 45 Worthington St. proposal. 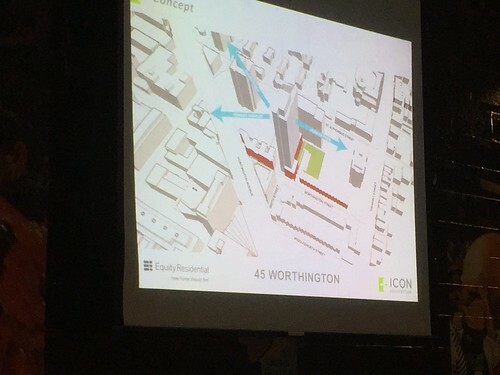 I don't understand how ANY architect can stand up in front of a community that has been ravaged by urban renewal and propose a 35 story WALL next to 3-5 story buildings on a quiet residential side street that survived the urban renewal. 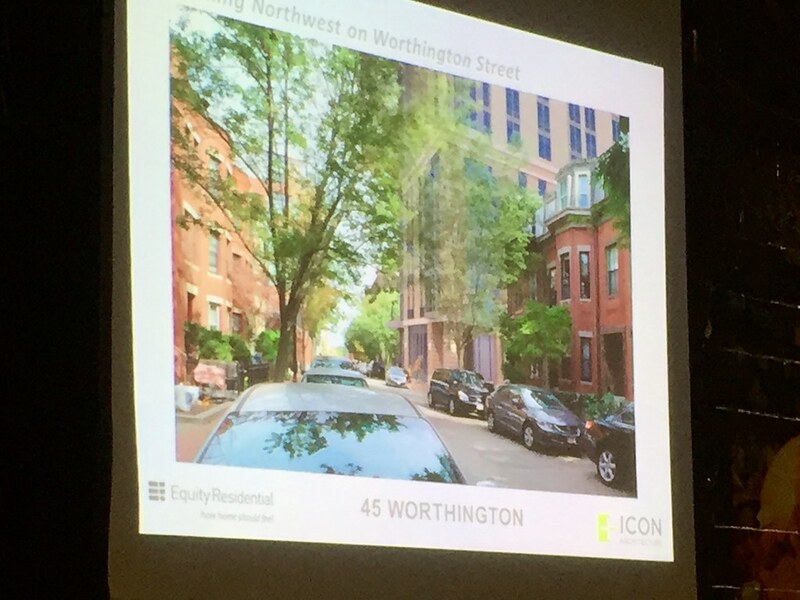 This is offensive to the professions of architecture, urban design, and historic preservation, but most importantly, this is offensive to the Mission Hill Triangle community. This is NOT Huntington Ave. 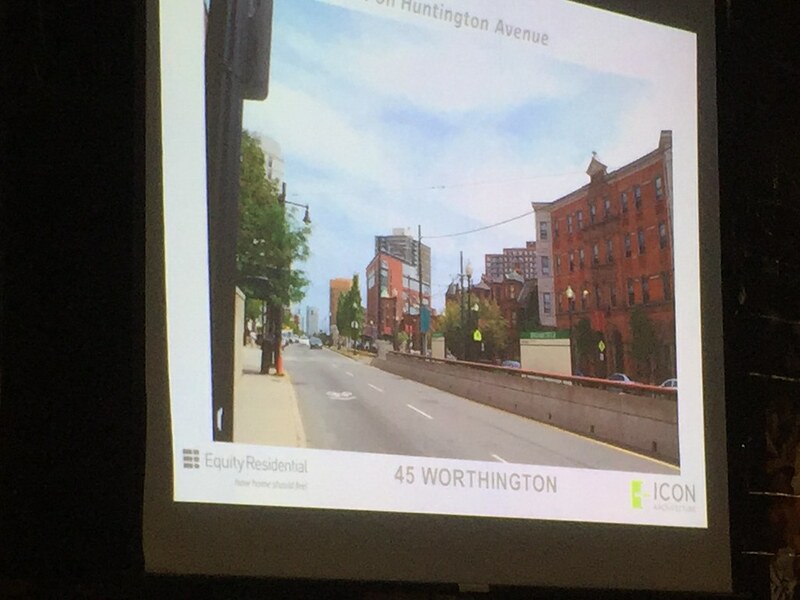 This is freaking Worthington St. 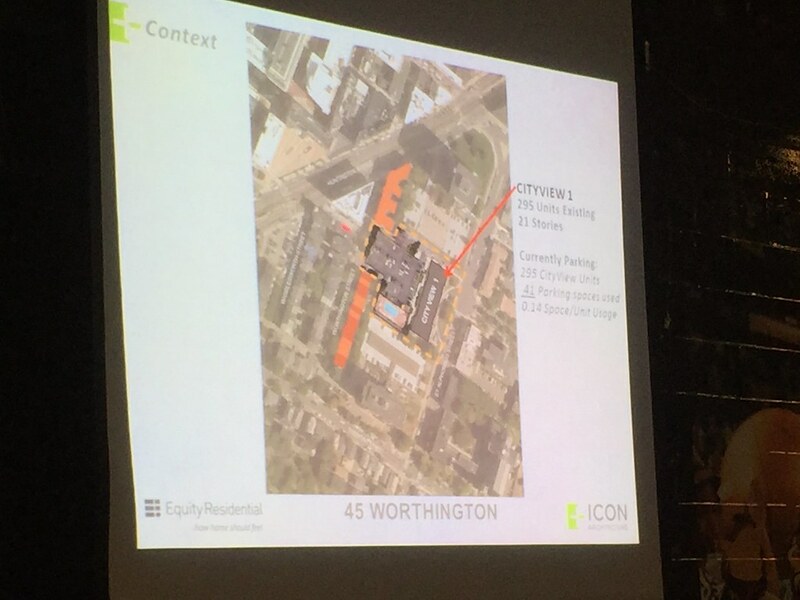 They even proposed putting the parking access on Worthington, essentially making Smith & Worthington into a driveway. 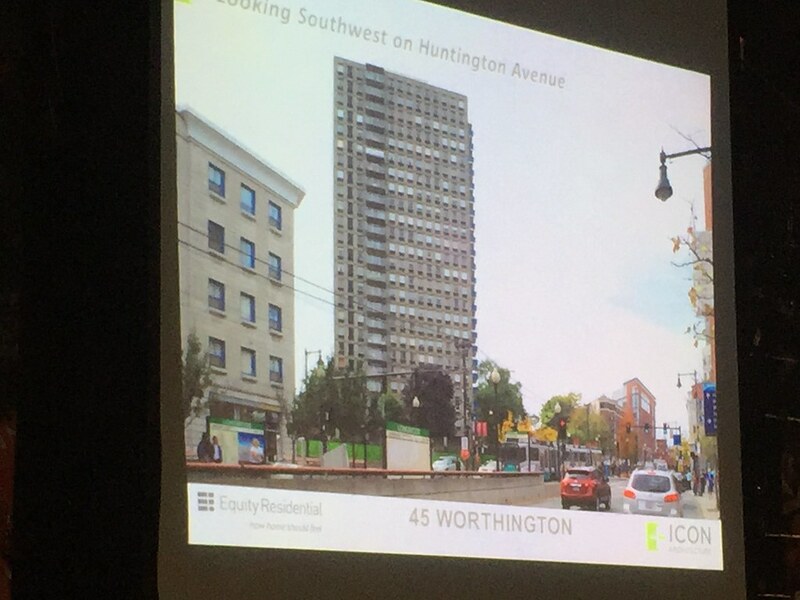 I have no problem with any of the other towers on Huntington like MassArt, but this one is proposed to be plopped on a street from the 1800s. It's just not right. 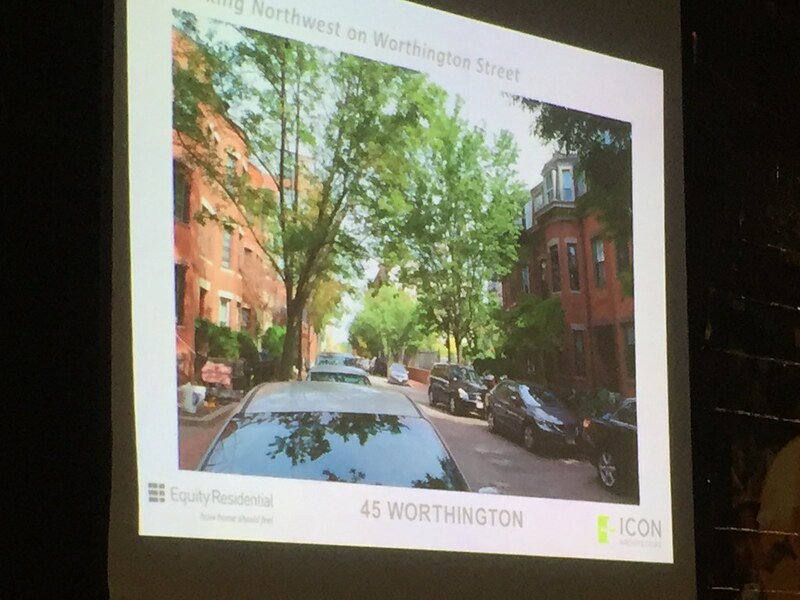 Worthington St is a gem. Luckily this project will never see the light of day. 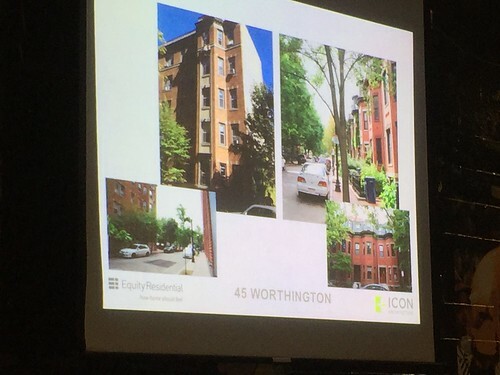 It violates all Mission Hill zoning (by double!!) and most importantly pissed off the entire community which called out their bluff: "if you expect us to be impressed next time when you come back with a tower half the size, you thought wrong. This is a horrible way to start this process." 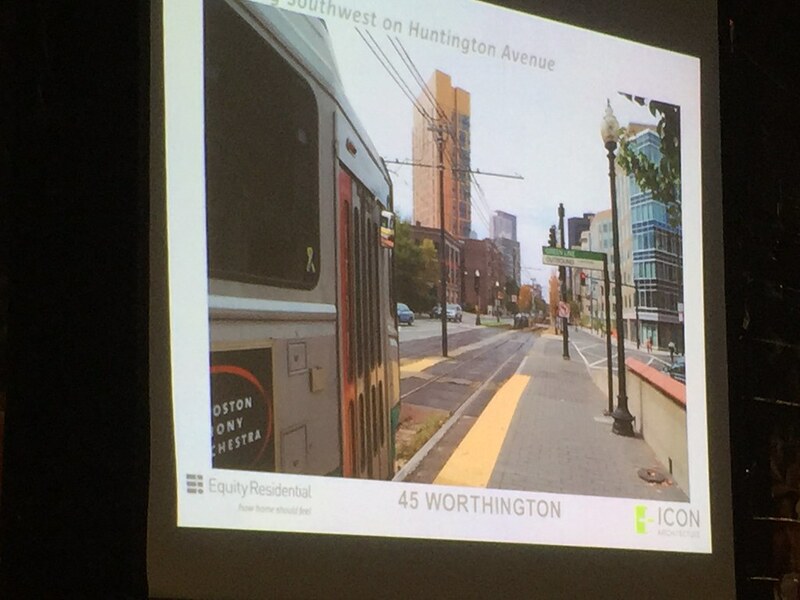 Data and Dshoost - it was hard to tell from the pictures - isn't that a 3-5 story podium on Worthington? 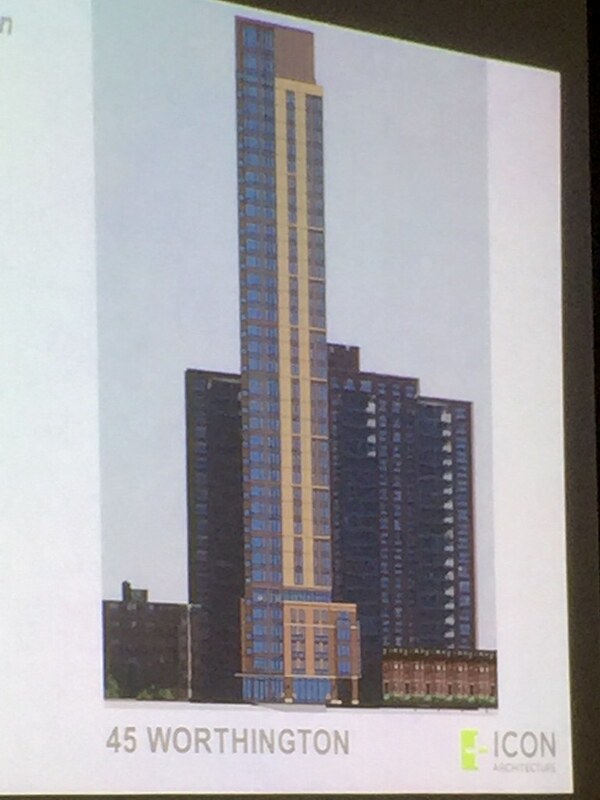 It didn't interpret the massing as a straight-up 35-story wall.